2012 is drawing to a close, and retailers and marketers are already looking ahead towards the next big trends in digital marketing. 2013 promises to deliver sales growth in eCommerce and mobile commerce, along with a new string of marketing “buzzwords” such as SoLoMo and big data. From among the clutter, we’ve compiled a list of the top 10 marketing trends every digital marketer should watch in 2013. 2013 will show a continued investment in mobile optimized websites and email. Studies show that consumers continue to prefer shopping on mobile sites (14%) over apps (4%). If 2013 finally proves to be the true “Year of Mobile,” mobile optimization will be a priority for retailers. In 2013, brands will take the leap beyond siloed Facebook, Twitter, and Pinterest accounts and begin to leverage the data from social media into the rest of their marketing mix. Expect to see personalized brand content based on social media user behavior, and social media integration throughout retail websites to encourage user generated content and product sharing. As always, content is king. In order to attract, acquire and engage current and potential consumers, marketers will continue to curate content that is compelling, relevant, and valuable to fans. Look for more calls to action in a variety of content in 2013, from blogs and social media to case studies and webinars. 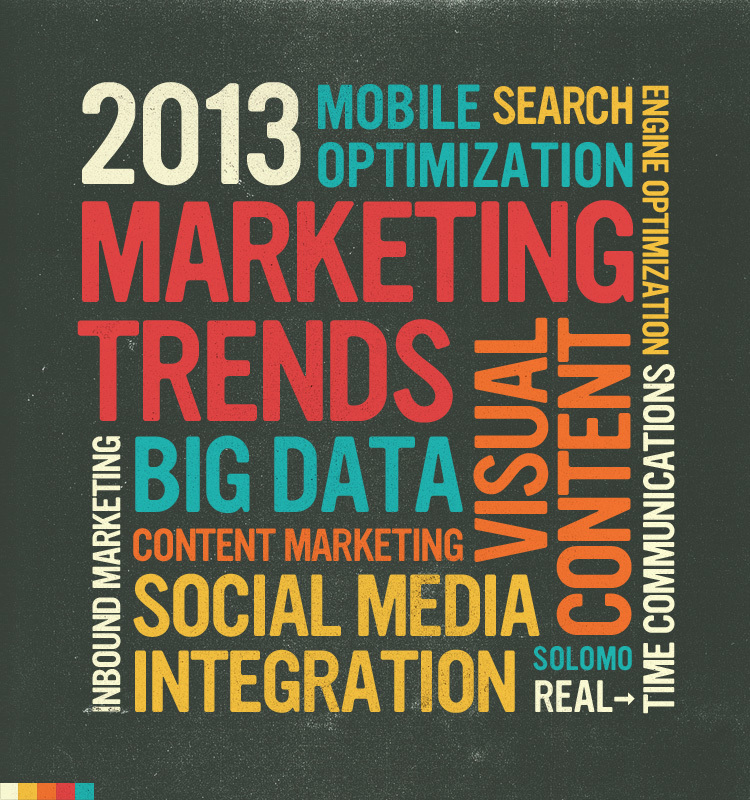 We will continue to see more marketers take advantage of real-time communications in 2013. While marketing campaigns have been hugely successful in the past, they are often time sensitive and cannot incorporate changing consumer trends. Real-time communications allow customers to engage with brands on their website and through their social media channels. With the increasing number of customer touch points, it has become difficult to truly analyze customer preferences. In 2013, we will see big data represented in a way that marketers can interpret and use. This data will influence day-to-day decision-making. 2013 will be the year of visual content. Sites like Instagram and Pinterest experienced sizeable user growth in 2012, proving that content does not always have to be written. Marketers will strive for an innovative presentation, with an increase of infographics, picture boards, photos and videos. Sales via mobile payment will become increasingly popular in the coming years. A study by Gartner forecasts alternative payments to grow 350% by 2016. In 2013, we should expect some of the big retailers to focus on a mobile-commerce solution. Search Engine Optimization saw many changes in 2012, and that trend will continue into next year. In addition to algorithmic changes, organizations are starting to increase their SEO headcount as well. A survey by Conductor shows SEO will be all about improving the content development strategy in 2013. The marketing budgets previously spent on outbound marketing will begin to shift towards inbound marketing. This shift from traditional to digital marketing will leverage blogs, podcasts, SEO, e-newsletters and social media marketing. SoLoMo, the intersection of social, local and mobile, is a powerful new marketing trend with the potential for significant growth in 2013. SoLoMo leverages the GPS technology in consumers' smartphones to deliver highly targeted, location based messages tied in with social networking. For Black Friday, Macy’s launched an iPhone app that sensed when a consumer entered the store, sent push notifications for special promotions, and even provided deal locations by floor and department through map functionality. Look for even more SoLoMo-driven apps and campaigns in 2013. Published on December 19, 2012 .